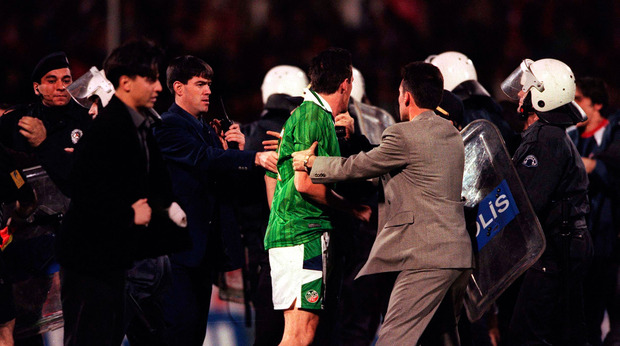 Ireland take on Turkey in Antalya in a friendly today, so here is a little flashback to Tony Cascarino's last game for the Boys in Green when he was "kicked off the pitch" in Bursa in 1999. This is a piece from Philip Quinn that ran in the Irish Independent on Friday, November 19, 1999. He took a punch in his first international and a few more in his last. In between, Tony Cascarino amassed a record 88 caps, 19 goals, and enjoyed a cult following among Irish fans. In the small hours of Thursday morning at Istanbul Airport, Casarino called time on a remarkable 14-year innings at international level. At 37 the numbers game was not in his favour and he made up his mind before the play-off with the Turks that win, lose or draw in Bursa, it would be his last fling. "I didn't want to hang around past my sell date. I'd told Mick beforehand this was my last game. I'd got a general feeling a lot of people felt it was time to go. I wanted to help the boys get to the Euro finals but sadly, it wasn’t to be." But what a way to leave the stage: thumped in the mouth by a Turkish opponent, Ali Eren, after the final whistle and then surrounded by a baying mob of blood-thirsty Turks who ripped into him like savages. "At one point they were all on top of me, players and fans who had run onto the pitch," he recalled. The intervention of FAI security staff, and Turkish police, restored order after thirty seconds of mayhem which made Midnight Express look like an afternoon tea party. Predictably, Cascarino was able to make light of what had been an ugly situation. "Their number two put one on me," he said pointing to a swollen lip. "I didn't know I could take a punch like that because he caught me with an absolute pearler." "Denis (Irwin) said they were coming at me from all angles," he added. So what had Cascarino done to incur the ire of the Turks? "It started near the end of the match. There was a bit of a scuffle that turned into a bit of a fight. I took a punch and a few kicks but it was all over quite quickly. "I remember my first game, against Switzerland in Berne, the centre half that day, Egli I think his name was, landed a few on me and they were a lot worse than I got tonight." Dubbed the 'Ice Cream Man’ because of his Italian surname – his mother Theresa O'Malley was born in Mayo – Cascarino received mixed reviews when he was introduced into the Irish set up by Eoin Hand, first appearing in Jimmy Holmes' Testimonial. Initially, the Irish fans called him Anto before changing to the now familiar Cas. "I got a call from a journalist, Reg Drury, who'd seen Tony at Gillingham. I had a look and invited him over for the testimonial. We didn't have that many options in attack at the time," recalled Hand. "He took a bit of stick at first but proved a great addition to the squad. I didn't think that he'd go on to make a record number of appearances but he's been a great servant." Commentating for RTE Radio in Bursa, Hand was appalled by the treatment dished out to Cascarino after the game. "It's terrible that his career finished with him being punched and kicked off the pitch. I know Cas hit out at the Turkish player but what choice did he have after being attacked?" added Hand. Overlooked by Jack Charlton when he succeeded Hand as Irish manager, Cascarino missed almost two years before forcing his way into the Euro '88 squad at the 11th hour with a goal in a 3-1 win over Poland. After that, he was never dropped from an Irish squad. One of the privileged few to be part of the Irish squads in the major finals, Euro 88, Italia '90 and USA '94, he started only two games out of 12 and was substitute in four. "I was cover for Frank Stapleton in Germany, was dropped after the Egypt game in Italy and injured for most of our time in America. I'd like to have been able to say the World Cups went well for me but they didn't." A personal highlight? "The Lithuania game which got us into the play-offs for the last World Cup finals. I had something to prove that night and it went well for me. "I wanted to finish with the record for caps and goals, that kept me going, and I got the caps one, which is the bigger one. Hopefully, Niall (Quinn) or Steve Staunton will get past me. "Of course, I'll miss it all. It's been a big part of me but life goes on." An immensely likeable character, Cascarino said an emotional goodbye to Mick McCarthy and the Irish players in Istanbul as he waited for a flight to Frankfurt.